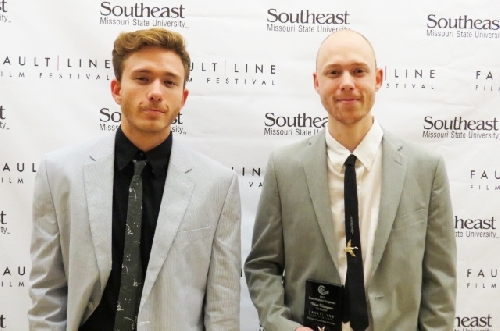 WIU Senior Austin Thompson, right, recently won a prestigious award in the Fault Line Film Festival at Southeast Missouri State University. He is pictured with his brother, Gabriel, who he said helped him through every step of the process. MACOMB, IL - Western Illinois University senior Austin Thompson, of Plymouth, IL, won an award from a Missouri film festival for his short film "The Break In." Thompson, a general studies major, with minors in film, creative writing and theatre, was honored with the award for the best mystery/suspense film in the Fault Line Film Festival at Southeast Missouri State University Nov. 13. Associate Professor of Film in the WIU Department of English and Faculty Adviser of the Interdisciplinary Film minor Roberta Di Carmine said she and Associate Professor of Theatre and Dance Carolyn Blackinton encouraged Thompson to pursue the project. "I met Austin last spring when he took my American film genre class," said Di Carmine. "I have the pleasure to have him again this semester in my film history class. Last semester, while chatting about films after one of our classes, he shared with me about his interests in filmmaking and that he was working on a few short films for one of his classes. I immediately told him that I wanted him to submit his work to some film festivals, as I was very excited to hear that." Di Carmine said she told Thompson he should submit his work to the Missouri film festival. "He was hesitant at the beginning, but then he realized that I was not going to give up," she said. "So, he let me watch the four short films he made to get my feedback; I then selected two of the four. We met again and then he submitted the two we both agreed on. I am very happy for Austin and so very proud of him. He is very attentive, and his way of paying attention to details is reflected in his short film, which won the award." Thompson said the entry into the Fault Line Film Festival was his first show in three or four years. "It was a new and amazing experience both making the films, as well as going to Southeast Missouri University to meet some great people and to receive my award," he said. "Everyone has been very supportive in the film, theater and broadcasting departments at WIU, as well as the people involved, like all my actors, crew and family, who were always there when I needed them." For more information about the festival, visit faultlinefilmfestival.org.